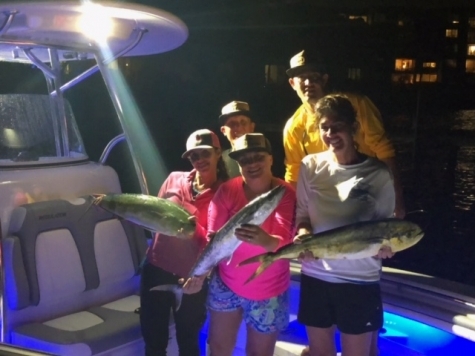 As usually it was tournament day and the alarm goes off at 2:00am and it was time pack up the truck with all our gear and head down to the marina. Leading up to the tournament we had some good success finding a few kings off the breakers and Juno ledge. We finalized our plan the night before and decided to run to Jupiter. We loaded up the live well with gogs and runners and had lines in at 6:30am. We had a few missed strikes on the deeper side of the ledge, but never had a solid hook up. We continued to work the area from 150ft to 90ft of water without any luck. After make several drifts and battling a ton of boats, we decided to make a move up to Loran tower ledge. By this time it was already around 11:00am by the time we got our spread out. The good news was we were marking a ton of fish and working great bottom. The bad news was we still did not have a king in the box! 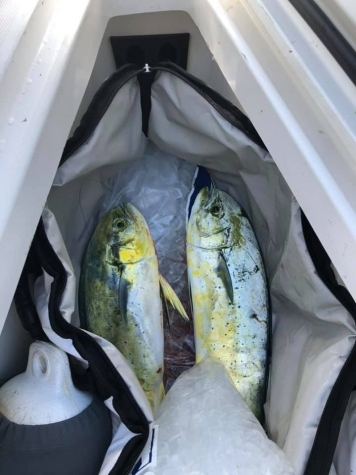 Within 15 minutes we got a bite, however it was a dolphin! In 66ft of water! You just never know! Now on any other day this would be outstanding, but dolphin were not an eligible fish for the tournament. Regardless at least we had some tacos!! Turned out he had some friends with him too! I tossed white bucktail jig at his buddy and got tight on another one. We could have put a few more in the box before starting a new drift, but time was of the essence. I knew we only had another hour of fishing before we would have to make a 60 mile run back to weigh in if we landed the king! Needless to say we never found the king we were looking for. It was a beautiful day and had a great dinner! Thanks always to Bullbuster for making the best products on the market and supporting Team Reel Dreams!